A north-east town is in line for a boost after becoming the front runner for a lucrative wind farm project. Fraserburgh Harbour is the favourite to land the contract for a new maintenance centre connected to the Moray East Offshore Windfarm. The centre will play a crucial part in the multi-million pound project, to build nearly 100 turbines in the Moray Firth. 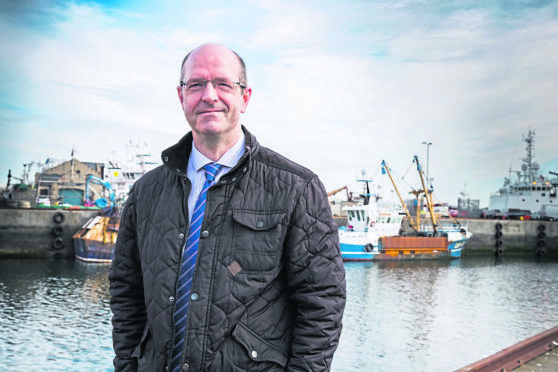 The deal – which will create dozens of jobs and allow NesCol to provide specialist training – was last night hailed as a vote of confidence in the facilities at Fraserburgh Harbour. Harbour chiefs have already struck a provisional agreement with the Moray East developers for the land required for the quayside facilities. The 20,000sq ft site will include a two-storey building, berthing facility for windfarm support vessels, pontoon facility for cargo and crew transport, a storage area and staff car parking for up to 40 vehicles. There would also be marine co-ordination centre, control room, workshop and offices. Harbour chiefs beat off competition from Buckie and Wick to be named as the preferred site for the base, which is thought to be worth millions. And it comes just weeks after they unveiled their own ambitious modernisation plans to secure the future of the port for years to come. Michael Murray, Fraserburgh harbour convener, said the development will provide an “economic benefit” for the town. He said: “Fraserburgh Harbour Commissioners are delighted to have been named as the preferred operations and maintenance port for the Moray East Project. Oscar Diaz, project director for Moray East, said: “I am delighted to be able to announce that Fraserburgh Harbour has been selected as the preferred operations and maintenance port for the project. “After construction has been completed, this will become the wind farm’s onshore focus for operations and maintenance throughout its lifetime. Last night, Banff & Buchan MP David Duguid said the announcement was “very positive” for wider efforts to regenerate the town. He said: “This is fantastic news for Fraserburgh Harbour and the wider community, providing opportunities for local training and employment. “I know that the harbour board has put a lot of time and effort into this, for which they should be congratulated. Banffshire and Buchan Coast MSP Stewart Stevenson said it was a “significant vote of confidence” in Fraserburgh Harbour. He said: “I’m delighted for the Fraserburgh Harbour Commissioners and for the town that this substantial amount of work has come to the Broch against stiff competition from other northern ports. The Moray East Offshore windfarm consists of around 100 turbines, capable of powering 950,000 houses. It is expected to begin generating power in the next four years. It is a joint venture between EDP Renewables, Engie and Diamond Generating Europe Limited.